The phrase, “live fast, die young” could be dedicated to shrews. These small carnivorous mammals have supercharged metabolisms, and spend all their waking moments hunting and eating. Despite being quite numerous in the right habitat, shrews are rarely encountered — alive, anyway. I typically find shrews post-mortem, lying in the path in front of me as if they had just simply given up the ghost mid-stride. Actually, that may be the case for those I’ve found, like the one in the photo. Shrews usually live less than 16 months and with a heart rate measured at 800 beats a minute, I think they just burn themselves right out. A lifeless shrew, then, is the antithesis of what shrews are all about. So I was fortunate indeed last week when I not only encountered a living shrew, but a congregation of shrews. Shrews are generally solitary animals, territorial and aggressive toward their own kind. The common shrew in my area, the Masked Shrew (Sorex cinereus), is noted for being especially voracious and intolerant of companionship. I had paused to listen for a bird song when I heard a persistent rustling in the leaf litter off the trail. I glanced over, and saw a shrew darting from a fallen log to a tangle of vines. The next moment, another scooted through the dried leaves. A few feet away, a sleek pointed snout poked out from under a shard of bark, then quickly disappeared. Over the next few minutes, I watched the speedy comings and goings of at least four animals before the forest floor returned to silence. Yes, I knew this was a special occurrence, because this experience was the second in my field career. Ten years ago, I happened upon the same type of trailside hubbub. That time, I found myself standing amid at least two dozen energetic shrews. They covered an area of about 20 square feet, and ran chasing each other under leaves, over logs, across my boots, in and out of dappled sunlight. And they were all squeaking at each other in high, whistled voices (most species communicate through vocalization, and Masked Shrews also use echolocation). Despite their quick, zig-zagging actions, their activity did not seem frantic, but vigorous and spirited. As you may have guessed, these shrew aggregations are presumed to be mating parties, but little is known about the behavior as it is seldom observed (my list of literature and references therein make up most of the published accounts). How did they know to meet in this place? How did they know when? How could these furtive, thumb-sized mammals carry on their spring rites, fearless of the tremors of footsteps and the not-so-quiet presence of a huge human? And how privileged am I to twice have had the opportunity to see this rare, delightful insight into the lives of these secretive animals? Hieshetter, D. 1972. A concentration of masked shews in Ingham County, Michigan. Jack-Pine Warbler 88:63. Vispo, C. R. 1988. An observation of a wild group of masked shrews, Sorex cinereus. Canadian Field- Naturalist 102:731-733. Woodfenden, G. E. 1959. An unusual concentration of Sorex cinereus. Journal of Mammology 40: 437. I've captured LOTS of living shrews when I go trapping for prairie voles in Urban, IL. Those shrews are most likely Blarina brevicauda. I credit their survival to my trapping technique (I check my traps often, every 4-5 hours, and I bait with lots of high energy foods like sunflower seeds and I insulate the live traps with cotton nestlets. I've only lost a few shrews, usually during cold nights. Shrews are interesting little creatures. And they have a nice soft coat of fur. Wonderful story! Though I have to admit, two dozen shrews would kinda freak me out. 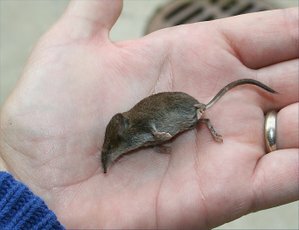 I see shrews all the time, and find them a little creepy….once I had two shrews running around my feet in an apparently agonistic fashion. I've also found dead shrews lying in the middle of trails–I'd wondered if maybe they'd been killed but not eaten through not being very palatable, but the "burn out" explanation works too, and I don't have to eat a shrew to test it! I guess I can count myself as one of the lucky few. I've had a lot of encounters with them (although obviously not lately) that usually involved me sitting quietly in the bush, playing hide and seek as kid, birding, or bowhunting. I've had them climb on my boots. They are amazing little creatures. I've also found them lying on the middle of paths. Perhaps its just an obvious exposed location, the other deaths going unnoticed in the leaf litter. Never tried to tame one though. In April, 1964, I saw a shrew swarm on Picnic Point, near Madison, Wisconsin. What I saw was a much more dense aggregation of as many as 20 animals in deep leaf litter contained within about two square yards. At the time, I was doing daily censusing of the birds on Picnic Point to see if I could show a correlation between weather and migration. A freind, Steve Curtis, and I censused the point every day in March, April, and May in both 1963 and 1964, and this was the only time that either of us saw shrews.